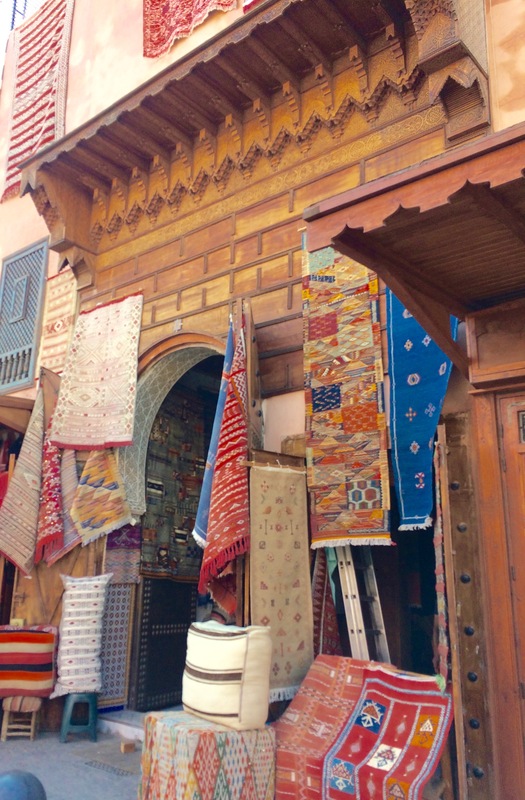 The legendary souks of Morocco figure repeatedly in novels and movies and word-of-mouth tales. But, if you really want to purchase something, all souks are not equal. I care about accuracy and a balanced view when writing about a new experience. 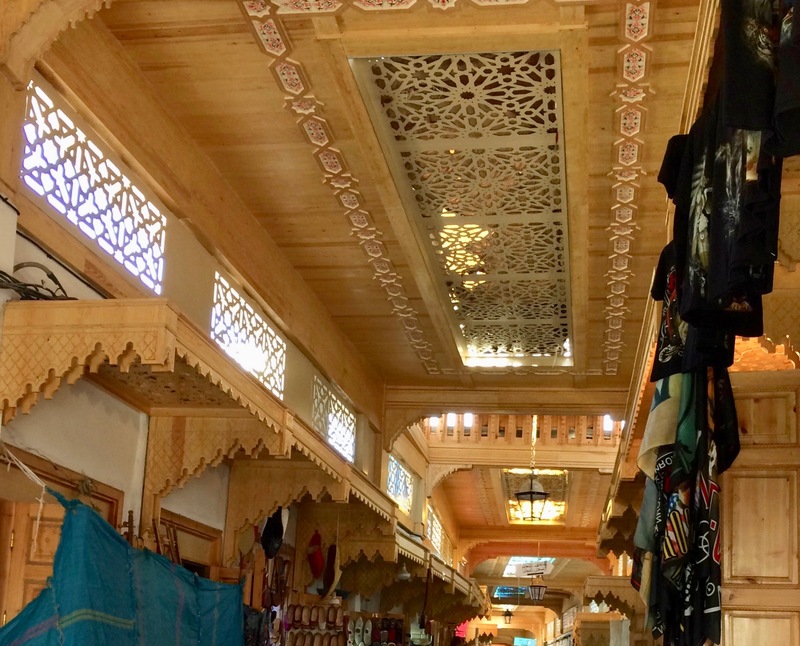 But I suspect that goal is indefinable when faced with a souk. 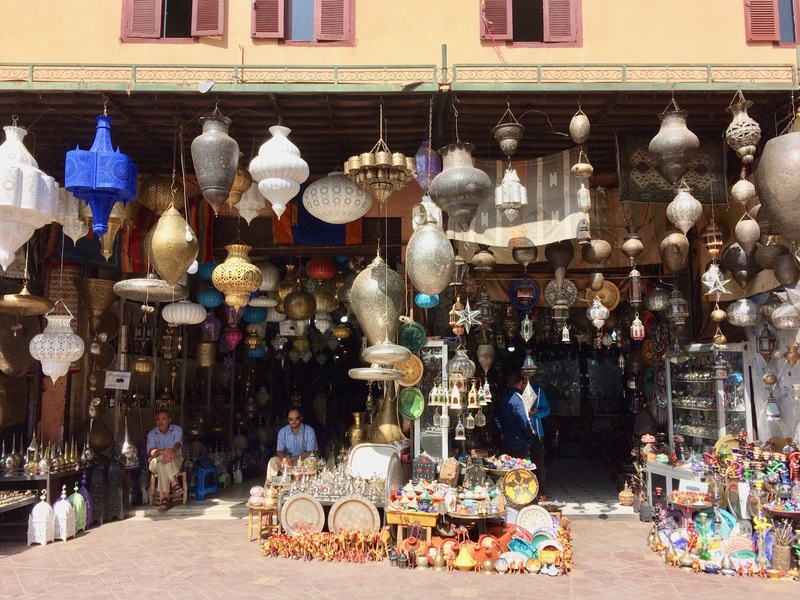 Well, I hope you read this outsider’s admittedly subjective run-down of the souks in five medinas of Morocco in the same spirit they were experienced — with exuberance! 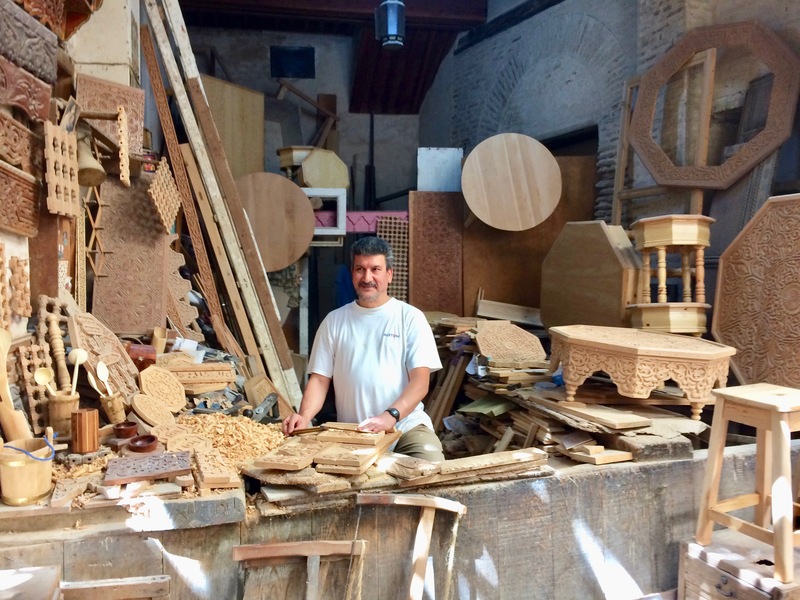 You can navigate Rabat’s medina fairly easily because of the grid that gives it structure. Of course, various little interesting alleyways can side-track you, but if you don’t have an unerring sense of direction (which some people think describes me), stick with the grid. Much of the medina consists of open-air streets closed off to traffic. 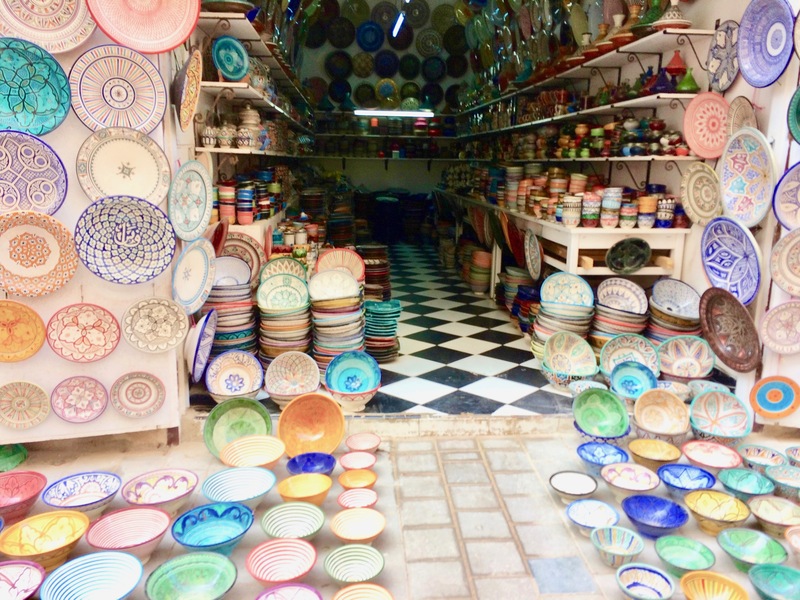 Since it was our first Moroccan shopping experience, we spent most of our time adjusting to the new sights and smells. I’d recognize Greek pastries anywhere in the world, though, and the two we bought were divine. 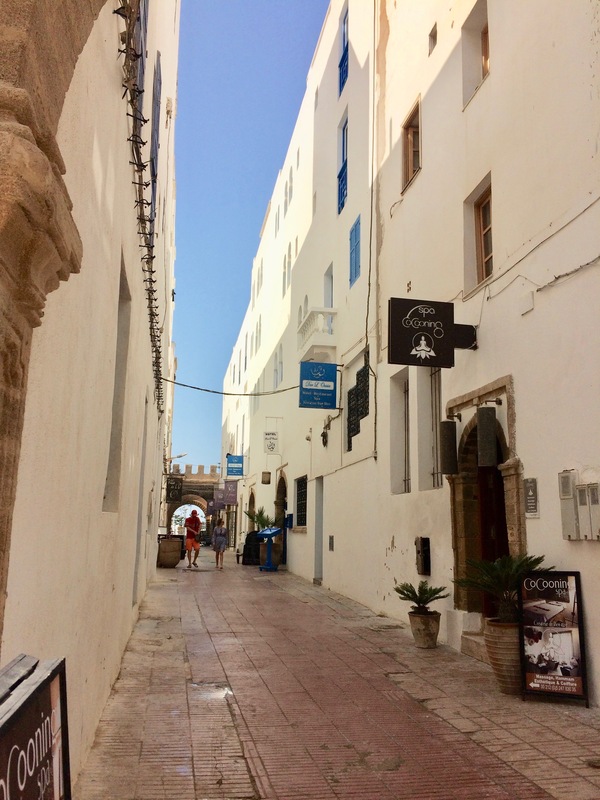 We left the open-air grid of the Rabat medina when we saw this beautiful street. Who could resist? The shops sold higher-end goods and the salespeople were chill, which meant I had space to consider. Result? I bought two gifts instead of one. 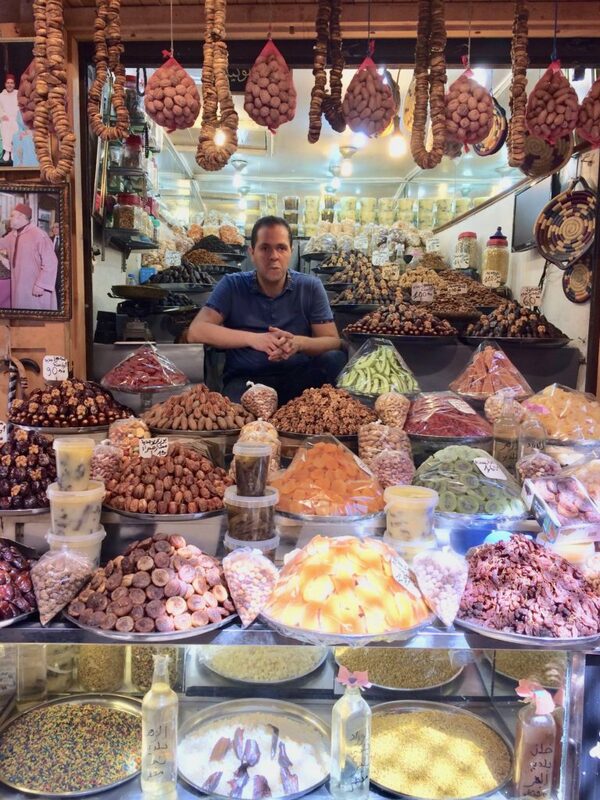 Actually, we went to the medina in the first place because it was close to the hotel and I needed socks. Yes, driven to the exotic by the mundane. For the record, compared to those I bought later at a western-style mall, the socks from the souk were the same price and higher quality. Browsing along, something that looked like sorbet or soft ice cream caught my eye. The product swirled in smooth peaks like frozen treats sold in ice cream parlors in hometown, USA. But it wasn’t kept frozen. So what was it? Turns out it was a kind of soft soap. Each scent had been tidily extruded into little stainless steel vats and truly looked edible. In fact, it was all so inviting that I ended up purchasing some. The merchant double-bagged it in plastic for travel. But by the time I reached home several weeks later, it had turned into a runny mess, which to my mind meant decomposition. Not something I’d want to try on my skin. I wish I’d gone back to the hotel and tried it out immediately, because I still want to know what that delicious-looking soap would feel like. 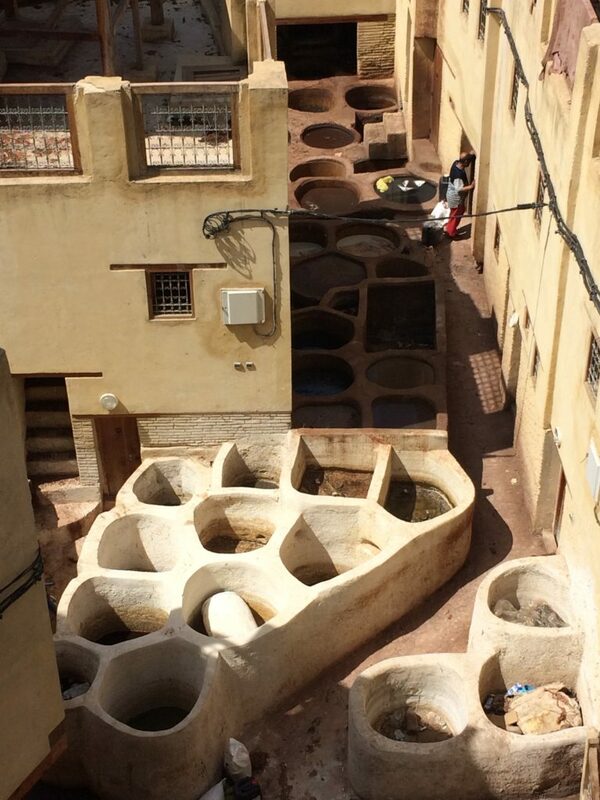 The medina of Fes, however, is quite another matter. The Moorish-style entry gate to Fes el Bali Medina (a UNESCO World Heritage Site) is very beautiful, but don’t even consider trying to navigate the maze without a reliable local guide. That is, unless the prospect of living forever in a medieval market of about 9, 500 alleyways is an option you’d enjoy. The narrow lanes wind in and out with specialty shops on every side piled high with colorful goods. The walls rise two stories high with living quarters above. Consequently, many of the lanes are rather dark and mainly lit by the souks on either side. 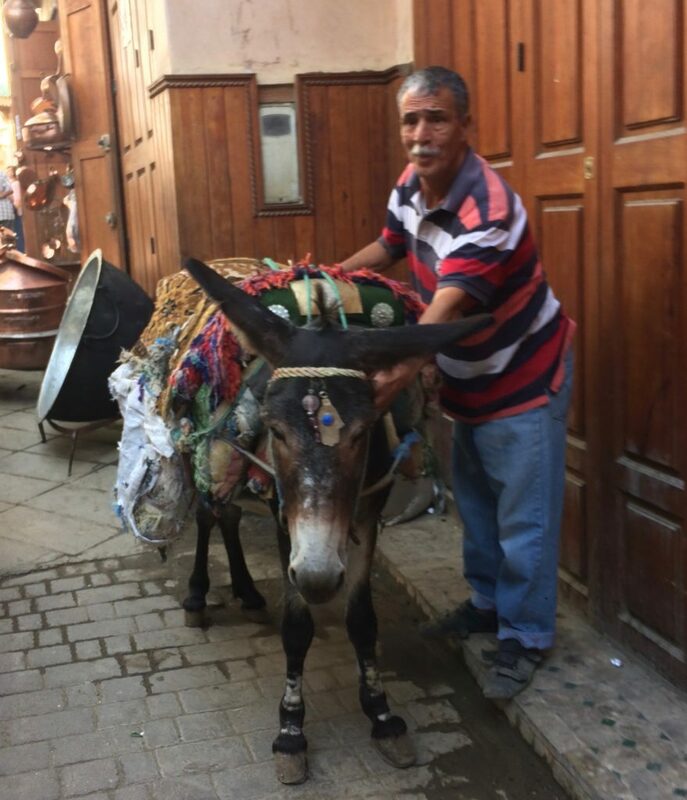 Sometimes in the Fes medina you’ll meet a donkey laden with goods, the alley just wide enough for you and the donkey to pass. A small, noisy motorbike also came quickly upon us, and I felt a lot less charitable about that encounter because of the noise and the speed. Plus, it seemed to me the carrying capacity of his bike didn’t come close to that of his uncle’s donkey. I can hardly resist the lovely stalls that sell spices! The colors are vibrant; the odors are sometimes subtle and sometimes compelling! 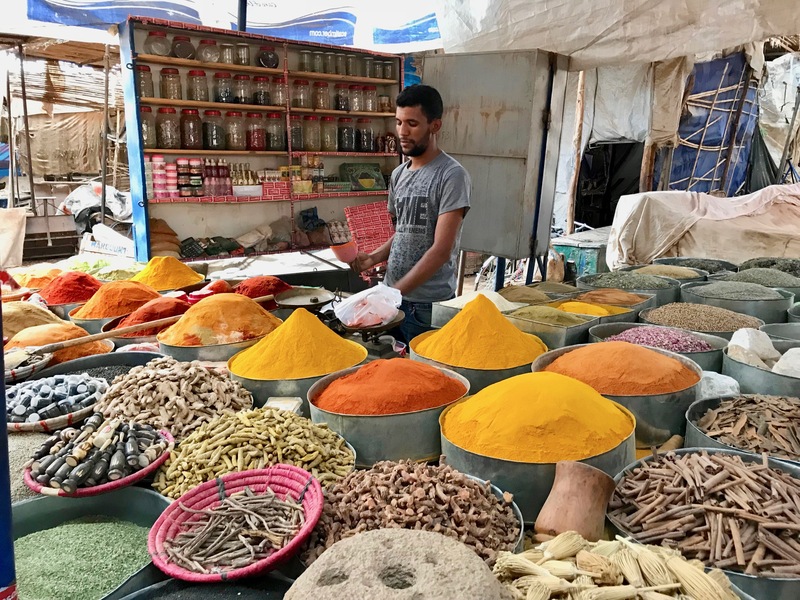 How I wish I could walk into a North American supermarket and experience a spice souk. At one point I heard bees buzzing, but I argued with my ears. Bees don’t go indoors as a general rule, so it couldn’t be bees I was hearing. Then I turned the corner! Yes, bees! A pastry shop selling honey-soaked goodies literally swarmed with bees as determined patrons. I flinched. But the owner continued stolidly selling his goods to human patrons who apparently felt no alarm at the proximity of venom-armed competitors! We stopped at the Terasse des Tanneurs for a tour of a particular tannery cooperative. Employees gave us each a sprig of mint to cut the heavy odors from the chemicals used to tan the hides. Apparently the idea is to hold the stem of the mint between your teeth so that the leaves are near the nostrils. 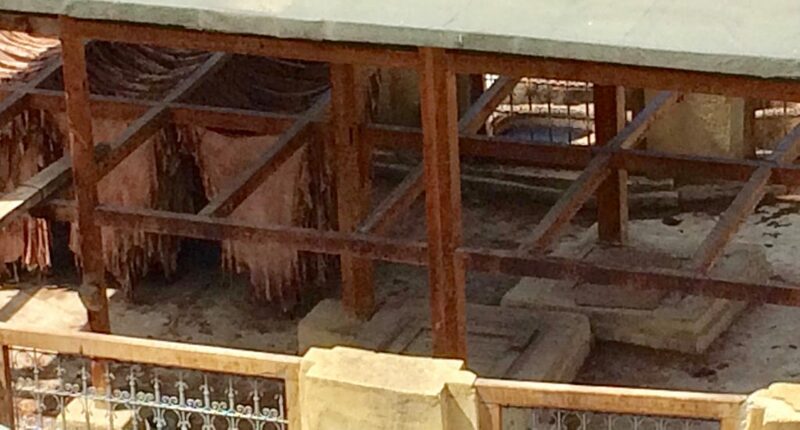 From the plaza overlooking the vats for tanning the leather, however, we could see little signs of activity. No vats full of dye ready for soaking hides, hence no odors. Maybe it was the wrong season of the year. I ate the mint leaf. The cooperative employs high pressure tactics in which one salesman is assigned to each person and follows doggedly beside. 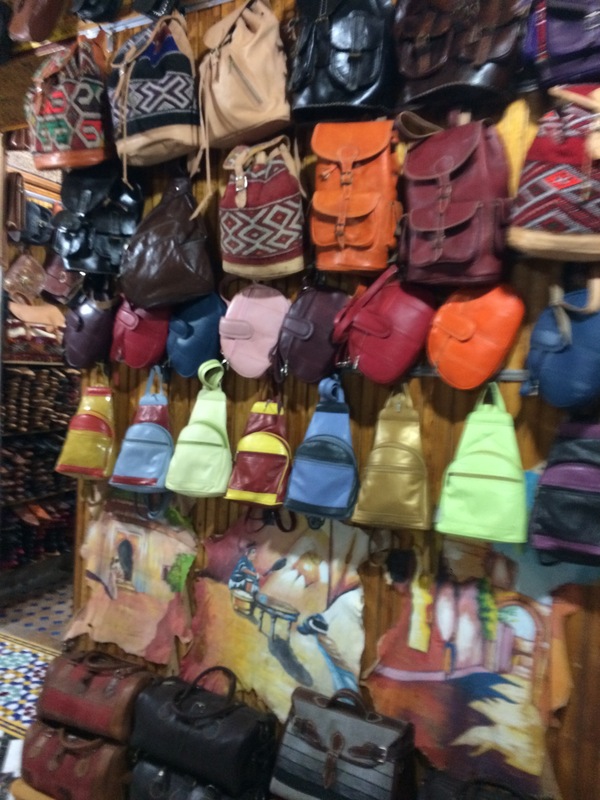 I wanted to stroke the leather with a certain amount of deliberation; I wanted to examine styles and colors and consider how the prices compared with those I saw in the souk at Rabat. But wait! There are no prices on anything. You have to ask the price on every item, knowing they will quote more than double what they expect to actually get. No matter where it happens, price negotiation is a fatiguing, time-consuming activity. I had worked in China for several years and become fairly proficient at bargaining, although it tended to make me feel a little small. [Actually, buying a car in North America also involves a certain amount of bluster and positioning.] 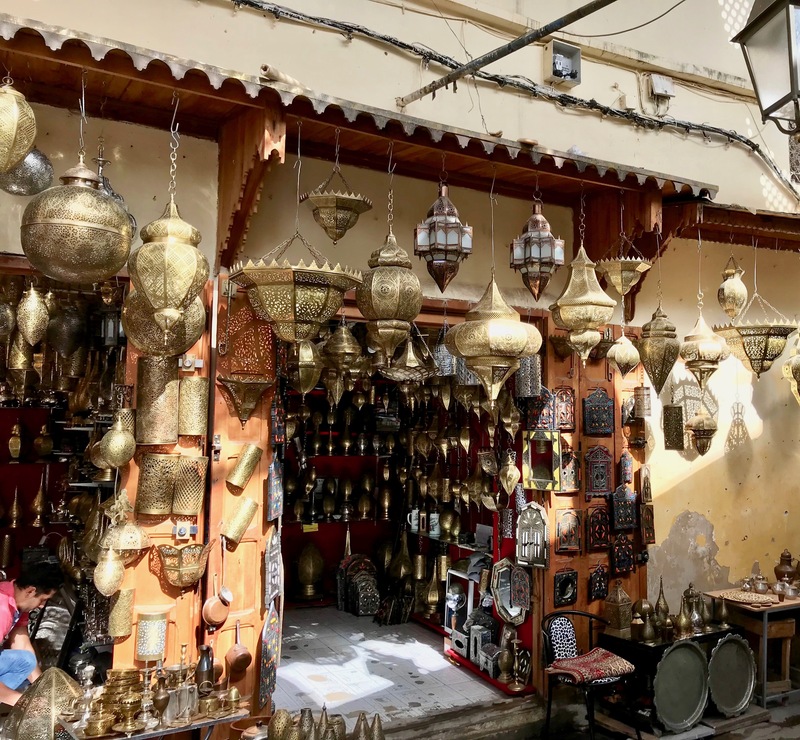 However, the recreational aspect of a leather purchase in the Fez medina had just reached its nadir, and the aesthetics of such a purchase were decreasing significantly by the minute due to the constant sale pitch at my elbow. I couldn’t do any of the necessary evaluative processes. So . . . I went away knowing that everything on the top floor was of the highest quality and that I could either buy three items there or the Ferrari of my dreams. The huge Jemaa el-Fna Square at the entry of the Marrakesh medina was relatively empty when we entered the markets. 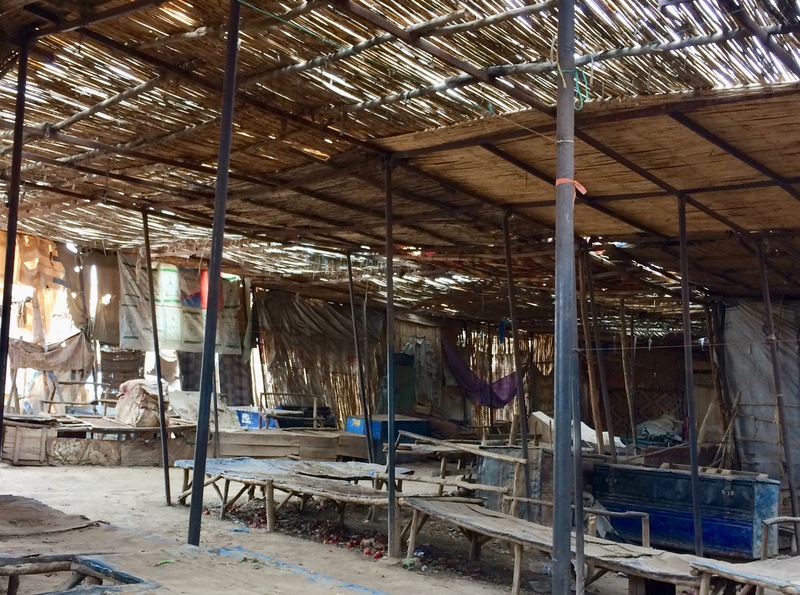 But by the time we exited the same space a few hours later, it had become increasingly raucous with hawkers of goods, Gnaoua musicians, snake charmers, and story-tellers. 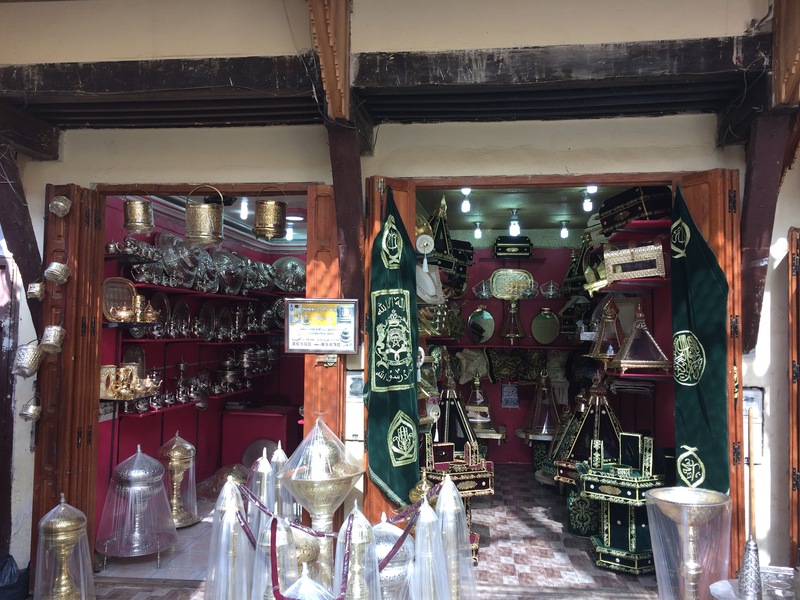 Shopping in the medina of Marrakesh, also a UNESCO World Heritage site, is far easier than in Fez. 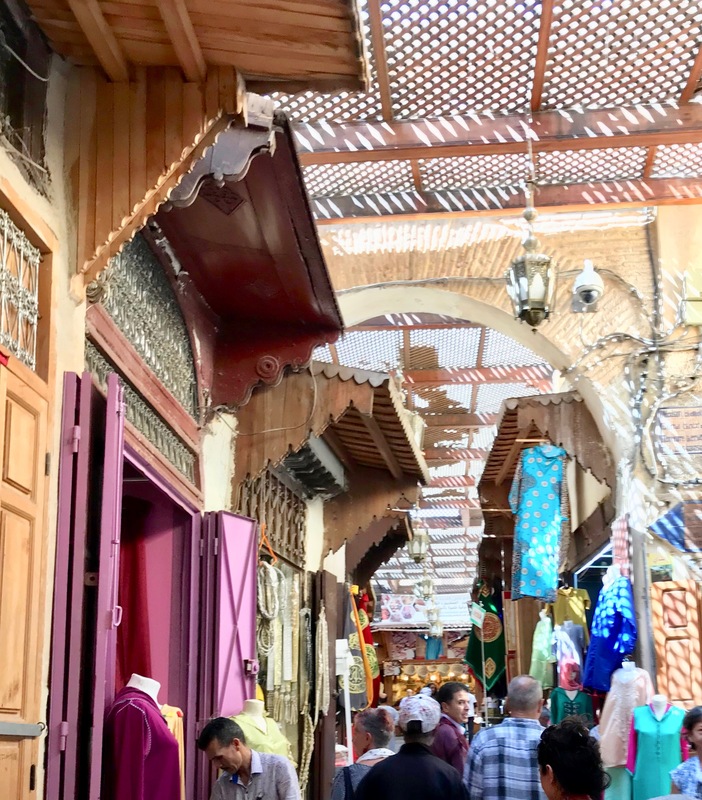 This, partly because the lanes in the medina accommodate the pedestrian flow more effectively than in Fez and partly because the merchants display their goods so enticingly. Consequently, we rather enjoyed our hunt for the perfect puff. 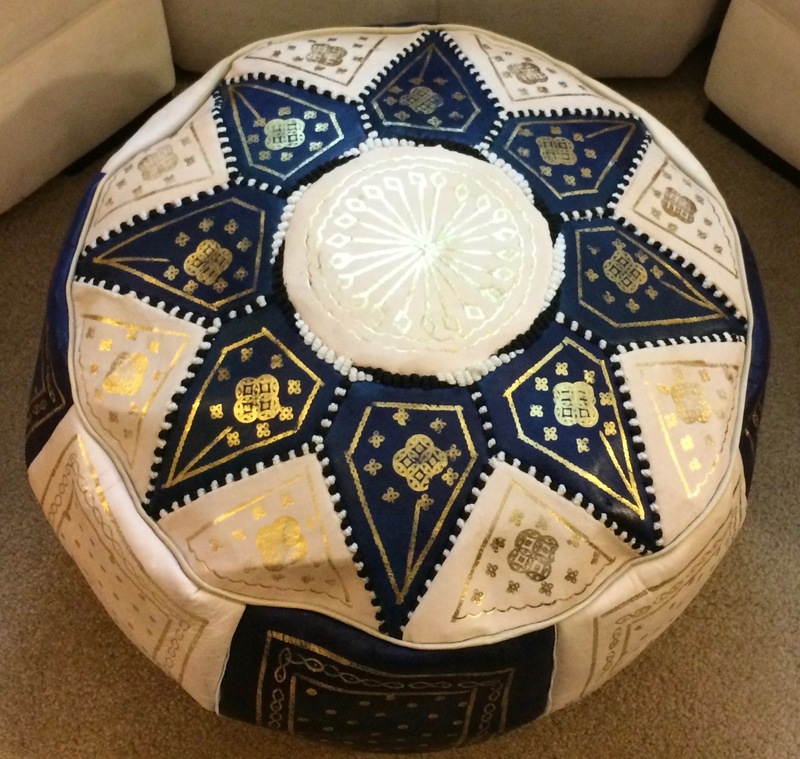 Incidentally, I was curious as to why the shop keepers called this foot rest a puff instead of an ottoman. Then I remembered that the Ottoman Empire was less than benign as conqueror in North Africa in times past — maybe that’s it. At any rate, an empty ottoman fits inside a mid-size suitcase rather nicely. Insert the stuffing when you get home! 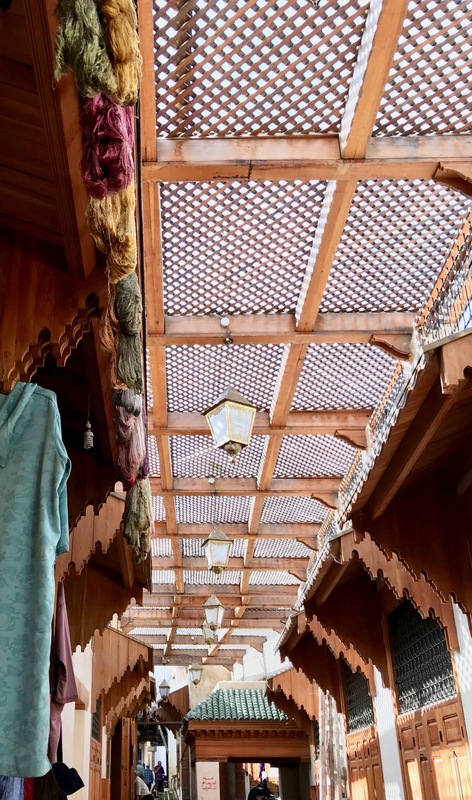 In another respect, the Marrakesh souks make for difficult shopping because, once again, the owners of the stalls are so insistent. If you can avoid getting sucked in by the touts — “a special tour for you” –, and if you can maintain your sense of humor as well as retaining your wallet safely on your body, it’s definitely fun to visit for a few hours. My daughter was amused by a pick-up line from a handsome young man. He called her by her first name, “Hey, ________! Remember me from that wonderful night in Amsterdam?” He grinned with a flash of white teeth and disappeared into a shop. 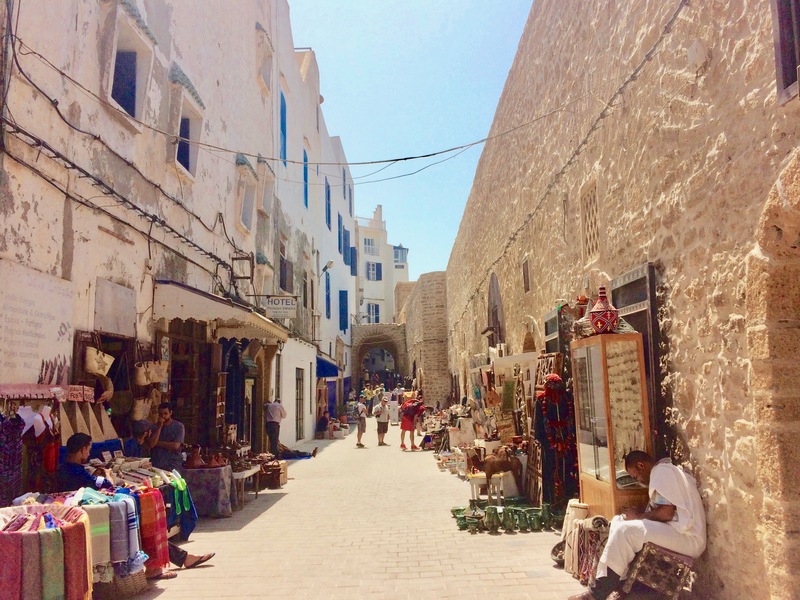 Such a treat to visit the beautiful city of Essaouira on the Atlantic Ocean, with the beach just a stone’s throw away, and the ocean breeze cooling the walkways and buildings. 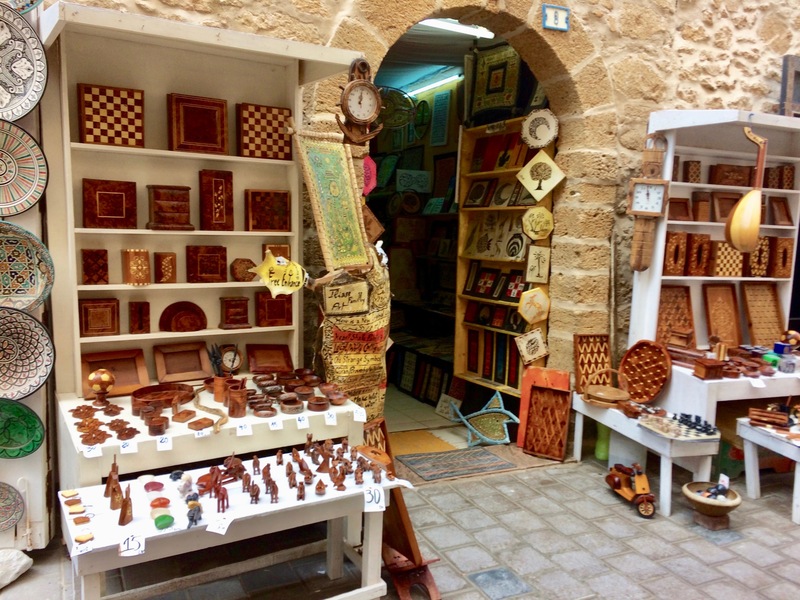 Essaouira’s medina (Mogador), similar to the medinas of Fez, Marrakesh, and Tetouan (Titawin), is also a UNESCO World Heritage site. But it’s very different in terms of space and freedom. Essaouira has by far the easiest medina for browsing. 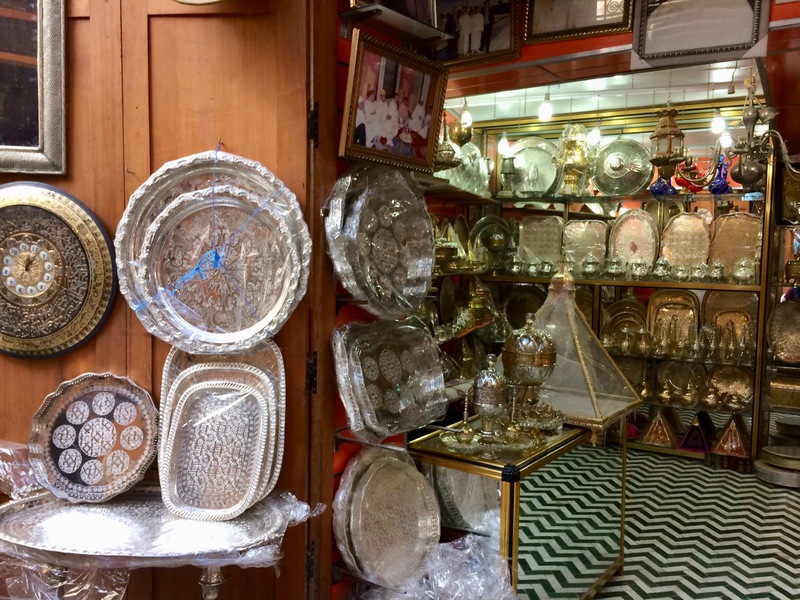 Souk owners let you consider the goods, look around a bit, touch the item you’re considering, set it down and look at something else. And not one of them pestered me. Ever. Additionally, the city is noted for its silver jewelry shops. 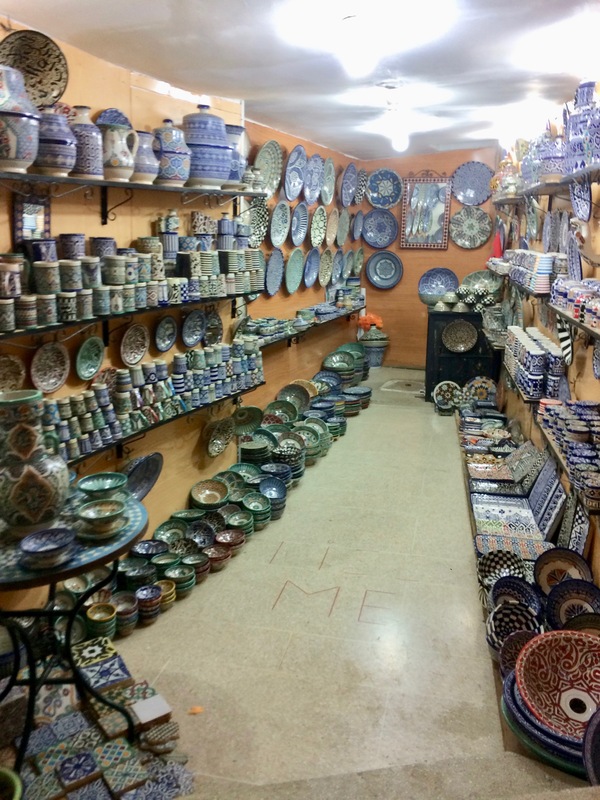 Next time I visit Morocco, I’ll save all my gift shopping impulses for Essaouira. 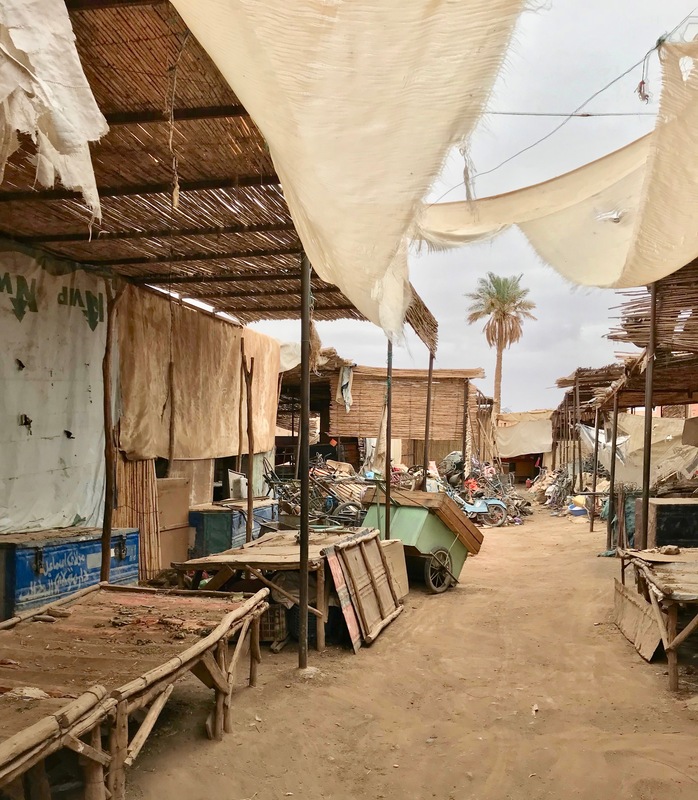 We stopped at this small desert village on the very edge of the Sahara while enroute to a camel trek on Erg Chebbi because our Berber guide promised us some of the best bread in Morocco. 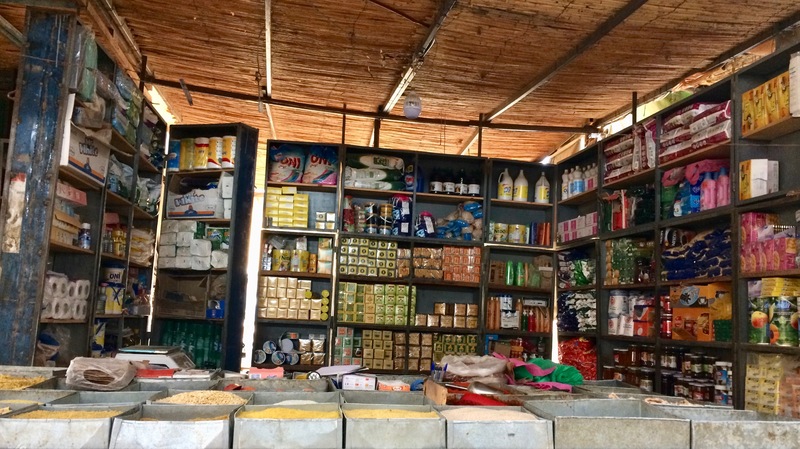 But it wasn’t market day and the deserted spaces with empty shelves felt a little melancholy as we entered. 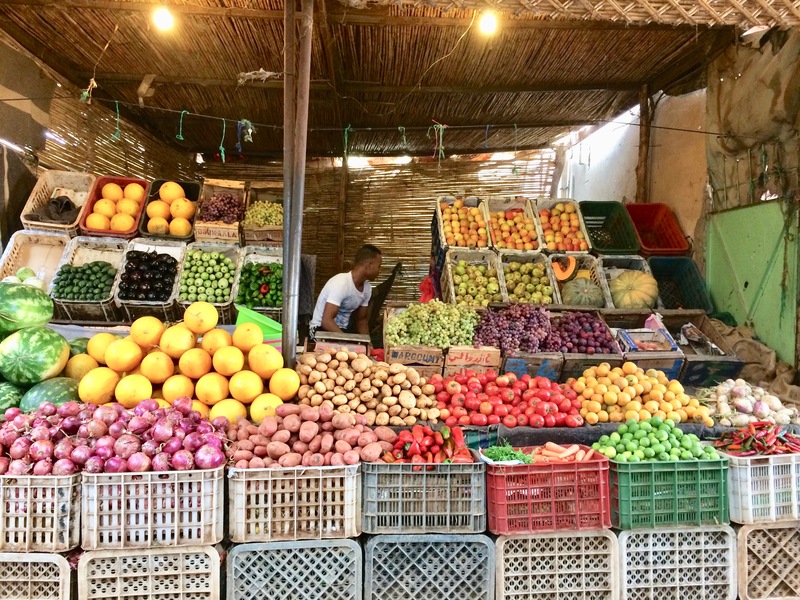 Then we turned a couple of corners and came to the section where various souks had opened to meet the mid-week needs of local households. Fortunately, the baker was in business, too. 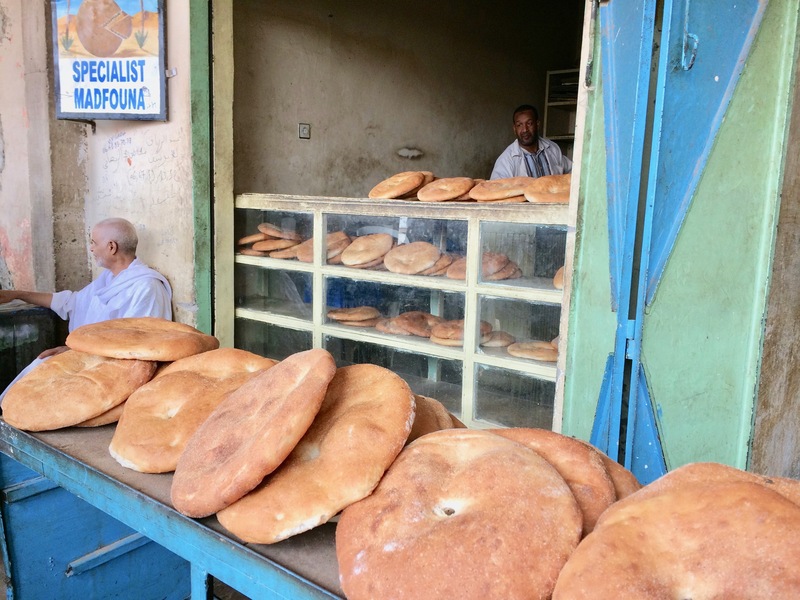 Our guide was right — such delicious warm bread, fresh from the ovens! The second best thing about our visit to this desert town (after the warm bread) was the donkey parking lot. Can you picture this parking lot crowded with donkeys on a market day? The locals claim it is. I’ll have to come back one day to see the sight.